This week, a friend and I fought traffic driving on the G.W. Parkway and through Georgetown to make our way to the National Cathedral, where best selling author, Richard Louv, was speaking. 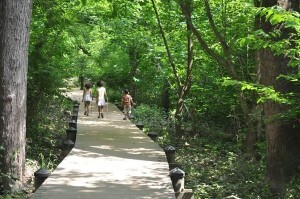 Louv, who coined the term, “nature deficit disorder,” wrote the international best-seller, “The Last Child in the Woods: Saving Our Children from Nature Deficit Disorder” in 2005, and incited a movement to reconnect kids with nature out of which the Children and Nature Network was born. In 2011, he published “The Nature Principle: Human Restoration and the End of Nature-Deficit Disorder,” which describes the impact on people of being disconnected from nature and how to restore the connection. It was well worth the trip! I wrote about the event in my Green and Simple column on the Old Town Patch. Read the full column: Green and Simple: Nature Deficit Disorder and the New Nature Movement.